Young families grow in style in this attractive and versatile home. The sky's the limit with an unfinished upstairs, while the downstairs lives big right now. The open great room and kitchen are enlarged by a cathedral ceiling, while living and entertaining space expands to the deck. Another cathedral ceiling adds volume and drama to the master suite which includes a roomy walk-in closet and a bath with a garden tub and double bowl vanity. A flexible bedroom/study features a cathedral ceiling and a double window with a half-round top. 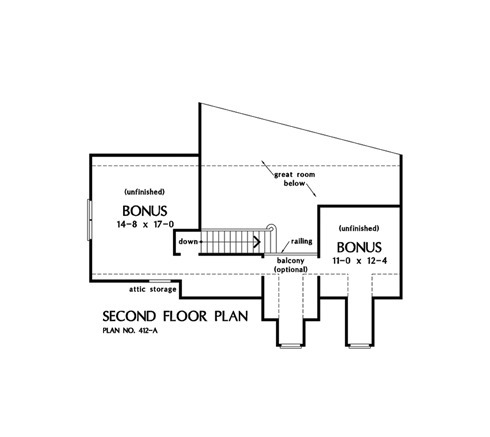 The second floor bonus space could be finished to allow two additional bedrooms and a bath, an office, or attic storage. 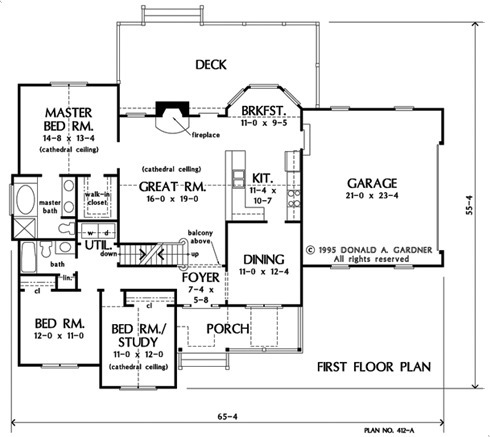 1st Floor: 1633 Sq. Ft. Bonus Room: 595 Sq. 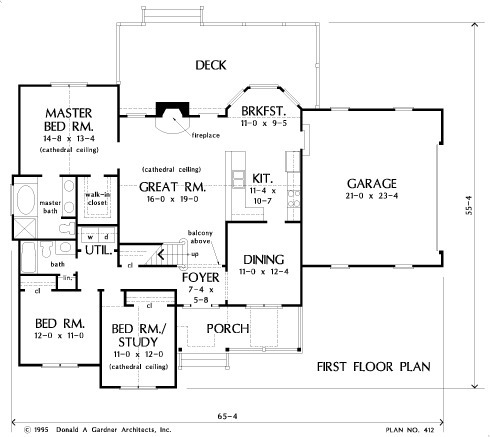 Ft.
House Dimensions: 65' 4" x 46' 0"
Dining Room : 11' 0" x 12' 4" x 8' 0"
Great Room (Cathedral): 16' 0" x 19' 0" x 17' 0"
Kitchen (Cathedral): 11' 4" x 10' 7" x 17' 0"
Breakfast Room : 11' 0" x 9' 5" x 8' 0"
Bonus Room : 14' 8" x 17' 0" x 8' 0"
Master Bedroom (Cathedral): 14' 8" x 13' 4" x 11' 8"
Bedroom / Study (Cathedral): 11' 0" x 12' 0" x 13' 6"
Porch - Front : 19' 0" x 7' 0" x 0' 0"
Deck / Patio : 30' 8" x 13' 0" x 0' 0"